You can eat it a la mode, adorned with caramel, topped with whipped cream. Some prefer to wash it down with a glass of cold milk while others enjoy it with some dark roast coffee. 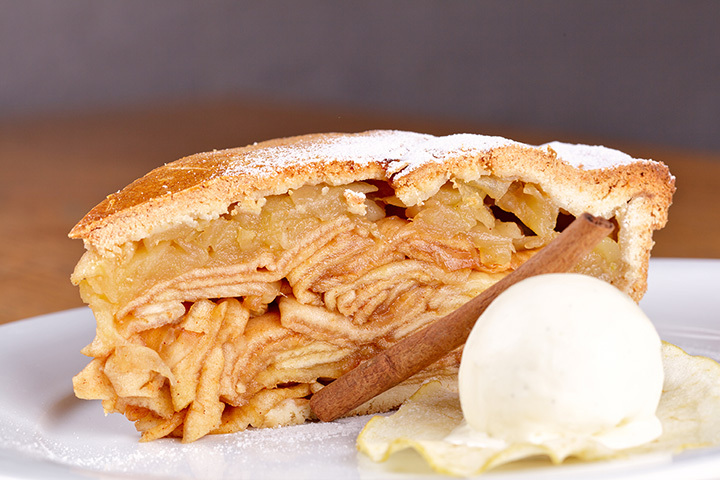 Apple pie is an American staple eaten year-round. And these shops in Nebraska get it just right. Don’t only enjoy some pie at Arbor Day Farm, but also explore the 260 acres of the venue. There’s a 50-foot-tall treehouse to climb, miles of forested trails, the Arbor Lodge State Historical Park, and of course the gift shop to buy sweet treats at. Courtesy of its website, the Village Piemaker claims “pie brings people together.” That’s the goal at the Piemaker. With handcrafted pies in small batches, the restaurant bakes all of its pies with quality fillings—never anything from a can. Purchase pies to bring home and bake in your own oven—smells included. While its name may be deceiving, its pies definitely aren’t. Grand Central Apple Market sells various groceries—not just apples. But in addition to the groceries sold, there are also fresh-baked pies, cakes, rolls, pastries and breads available. Emphasis on pies! Found on High Plains Homestead, Drifter Cookshack is a small eatery that boasts “good old-fashioned cooking with homemade pies.” The pies range from classic apple to cherry, with crimped edges and fruit oozing through the crust. Make a weekend of it and stay at the Homestead; eat all the pie that you can. The Green Apple Cafe offers a little slice of home. In a retro-looking cafe dining area, enjoy a homemade pie from family recipes. Bask in the ambiance of freshly brewed coffee, baking apple pies, and friendly customer service. It’s one of those places you stop for a slice and end up going home with the whole dang thing. They have baked pies, cream pies, and fresh fruit pies. Choose from apple, cherry, blueberry, peach, rhubarb, mincemeat, pecan, custard, lemon meringue, lemon silk, turtle fudge, fresh strawberry, fresh raspberry, and more. Need we go on? Never been much of a baker? Place an order at Stauffer’s for a holiday pie. Whether it be apple for Christmas or a berry pie for the new year, choose from more than 50 different flavors to satisfy the family. Stop ragging on yourself for being a poor baker. Treat the family to a sweet pie from Stauffer’s. According to its website, Sweet Magnolias is a “boutique bakery specializing in perfectly crafted, melt-in-your-mouth confections.” Bring a friend to enjoy a sweet treat at the cafe or check out the savory section of the menu. Magnolias offers slices of pies along with other delectable pastries. A unique location in Nebraska, the HUB is actually a mixture of a retail store, a coffee shop, and a soda fountain. Browse the aisles with pie in hand or coffee to go. It was originally built in 1906 as a general store but has expanded to offer pies and pastry treats as well as non-alcoholic beverages.